Hill is the founder and CEO of StoryUp VR, a virtual reality company that provides guided meditation and positive thinking activities designed to reduce stress. Founded in 2015, StoryUp recently launched a product for corporate use and an app that includes Ledford’s waterfall experience. StoryUp’s technologies have been used in corporations, dentist’s offices, military bases, chemotherapy, dialysis clinics and nursing homes. As she travels across the world to promote her product, Hill said she has seen the positive impact that virtual reality can have firsthand. 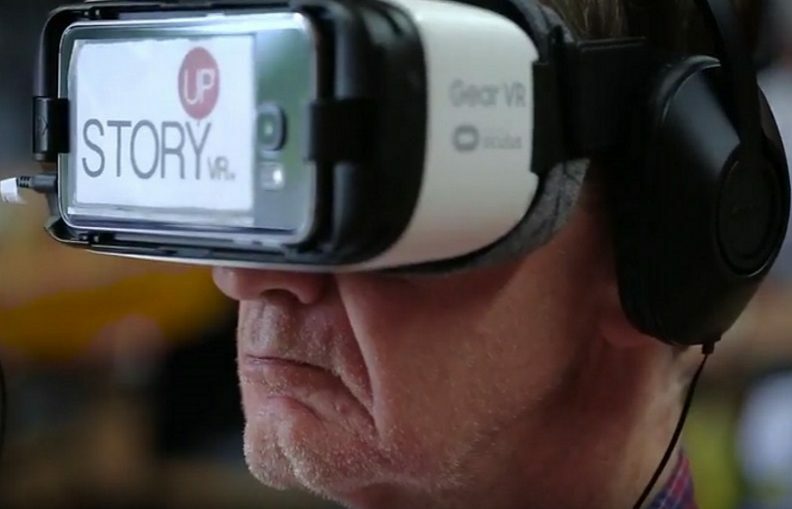 StoryUp’s new virtual reality app can be used in conjunction with a VR headset to address acute, situational or workplace stress. “It allows the wearer to control a virtual reality environment with their thoughts,” Hill said. To achieve the desired outcome, a series of positive thoughts guide the wearer to a place of calm during a three-minute meditation. Viewers watch their brain activity on the screen as a blue line moves in conjunction with their thoughts. As long as the blue line doesn’t intersect a red line, a viewer will continue to see a tranquil environment. The tool can help employees find the mental peace needed to deal with a tough day, Hill said. The product has been shown to quiet brain stress in four minutes. Hill recalled a man at a conference who took off his headset and had tears in his eyes. But there was a silver lining to the story. “He said, ‘I’m going to have to work a little harder to think about the things that make me feel positive, to bring them out again.’” Hill recalled. She said the experience made him more aware that he did have deep, happy memories. He just had to figure out what they were. To understand the connection between brain waves and mood, Hill collaborated with Jeff Tarrant, a licensed psychologist who is board-certified in neurofeedback and director of the NeuroMeditation Institute in Oregon. They concentrated on neurofeedback, which collects and displays brain activity to help people monitor their brain functions. Studies for the meditation experiences involved measuring volunteers’ brain waves before and after they viewed a StoryUp meditation session. Tarrant and his researchers looked at regions of the brain associated with a stress response before and after viewers saw the program. The testing process for the positivity experiences involved monitoring the front two electrodes on a volunteer’s forehead. Those electrodes are associated with gamma brain waves. “Gamma brain waves are the fastest brain waves we pay attention to, and what we know is that when someone is depressed or pessimistic or worried, the gamma asymmetry tends to lean to the right,” Tarrant said. He said the StoryUp experience is intended to help viewers shift their brain activity from their right electrode to the left. Now, he said, they’re doing an additional “full-blown research study,” and finding many of the same results as their initial study. “People are reporting being less stressed and anxious after watching it, and from a brain wave response, we’re seeing changes quickly,” he said. The company is now involved in a research study to monitor whether the meditation experience decreases anxiety in patients who scored in the “moderate” range on an anxiety questionnaire. He said the results aren’t just visible on paper. The impact began with a virtual reality strategy involving war veterans. Before founding StoryUp, Hill worked for Veterans United Home Loans in Columbia. She created a program called “Honor Everywhere” that allows veterans unable to travel to Washington, D.C., to explore the nation’s war memorials through virtual reality. Their reactions were the catalyst for her exploration, which would eventually become StoryUp, she said. Hill said she was so inspired by the reactions that she decided to leave her job. “I knew when I saw my first experience that this was the future of technology,” she said. Now, she partners with Central Missouri Honor Flight to send VR headsets to veterans who cannot visit the memorials. Hill recalled a terminally ill veteran who, according to his caretaker, was unable to lift his hands above his head. He needed assistance to put on the headset, but during the experience, his condition seemed to change. Hill said her company currently has a project to make people aware of heart-rate variability when they’re wearing the headsets. An international project is also in the works, she said. Yet, despite the progress StoryUp has already made, Hill said they’re not resting on their laurels. “It’s rewarding, but this is when the hard work begins. Truly,” she said.